If one of the roles of photography is to reveal aspects of the world, another is to subvert established notions and conventional wisdom. Ambroise Tézenas sets out to confound us. 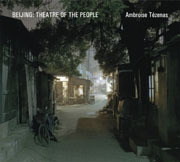 Many visitors to Beijing come away with a sense of a noisy, fast, teeming and dusty city seriously intent on uprooting its past; Tézenas chooses (in the main) to portray hidden backwaters in a filmic and melancholic mood and even the massive reconstruction projects he depicts are virtually without people. “It may seem strange but at no time did I experience a sense of the population density of Beijing,” he avows. This publication won the European Publishers Group Award for 2006 and it certainly reflects a familiar zeitgeist of contemporary photography. Many photographers working at the edge of those muddled crossroads between journalism, documentary and art concentrate on what theorists call the Absence of Presence. Tézenas expresses strong social concern for what is happening to Beijing and its citizens but his creative choice is to make people non-existent or transient in his images. This is an artist’s decision not a documentarist’s; we learn a lot about Tézenas’s response to the situation, little about the experiences of people most affected by change. As a member of the French Agence Editing, Tézenas’s former work was predominantly in the field of reportage; he was heavily influenced by the photographers of Magnum and “this has had an impact on my way of looking at everything that touches on photography”. Unlike some prominent ex-photojournalists who enthusiastically reject their past allegiances by embracing the art/gallery scene lock, stock and barrel, Tézenas is loyal to what he calls the “defining experience” of commissioned press work. In Beijing, however, Tézenas worked with a 5 x 4 camera during five trips between 2001 and 2005; he was able to witness the wholesale demolition of the old residential areas, or hutongs, as the city embraced a massive modernisation and redevelopment programme with one eye on the 2008 Olympics and another on China’s emerging commercial clout. He walked for days through Beijing, lugging his heavy equipment, “a bit like a disorientated pilgrim”. Tézenas’s vision is aesthetically intriguing but curiously devoid of emotion. The night time images of this disappearing world become repetitive and stylistically similar so we end up with documentation rather than comment or interpretation. In spite of his reluctance to engage with people, it is the photographs depicting people that stay in the mind. However hard the author as artist sought to distance himself by using a large format camera with tripod, he couldn’t quite suppress his reportage instincts.